Park hours are just place holders to help guests sort of plan their park choices 180 days in advance. I say “sort of” because they can still change Extra Magic Hour parks after you’ve done the work to book that special meal 190 days before most people even thought about waking up. Initial park hours are ALWAYS estimated lower than they become. Park hours typically undergo 3 to 5 changes over 6 months and can even add on an hour while you’re touring the park. You’ll find 5pm Animal Kingdom closings, but the park WILL close later. 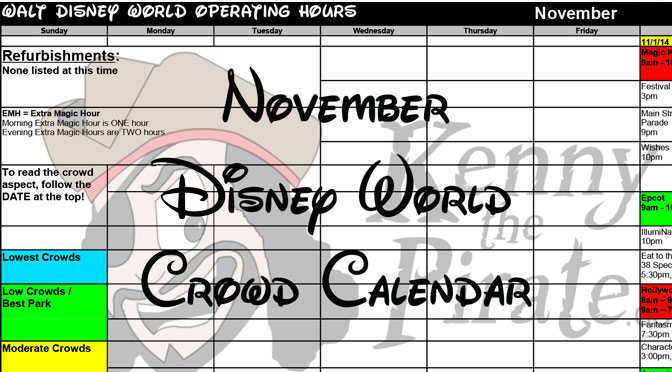 Magic Kingdom is currently scheduled to close at 4:30pm on November 17th. It could be because they are hosting a special media or travel agent convention or they could eventually change the hours. For the moment, it should be the one day at Magic Kingdom where you walk on rides without paying $149 per person. You will not find ANY evening entertainment offerings listed for Magic Kingdom, Hollywood Studios or Animal Kingdom. Don’t panic, it will come later! If you actually USE the morning Extra Magic Hour, it’s a great benefit, but parks do get busier around 11am and have their worst waits on these days. Many guests have the great ambition of arriving at a Disney theme park at 7:30am, but aren’t willing to wake up at 6am on vacation. Sleep in on a day you’ve planned for morning Extra Magic and you’re in for a 3 FP+ day with lots of visits to the Country Bears, Carousel of Progress and Peoplemover. Several events could affect your touring dates including Wine & Dine Marathon, Epcot Food & Wine Festival, Mickey’s Very Merry Christmas Party, Jersey Week / Veteran’s Day weekend, Thanksgiving and Holidays Around the World. I just got off of the phone with a cast member and they said it’s the International Association of Amusement Parks having a private event at the MK that evening. It will only effect that one park on that one evening. Checked the IAAPA website. They are going to Seaworld. Maybe it is a mistake they haven’t fixed yet. Or something else. My family is arriving just after Thanksgiving this year. We want to do Magic Kingdom on a day that they don’t close early due to the Christmas Party. Our options are Saturday the 26th or Monday the 28th. I know you don’t recommend MK on a Monday, but do you think with the Thanksgiving crowds that MK will be worse on that Saturday? How bas is going on the parade taping day? Why does Disney not post these hours on their site yet — this advance notice is great! i’ve been checking their site site every day but they are only to Oct 28th at this point. Thanks – your site is fantastic! I see you have MK as green on thanksgiving. Would you recommend going to MK or is another park a better choice? I was debating doing HS and going to 50’s PTC for that “home cooked meal” atmosphere. Either would be a good choice. You can book Liberty tree tavern and get a thanksgiving meal though. Maybe its just me but, I dont see hours or your prediction for Nov. 26th and 27th. Do you think the Christmas party on Veterans Day? Or another evening that week? Also, do you think that Club Villian will still be an option in early November? If you can choose a different day, do so. No idea what they will do with Club Villain by then. What do you mean by “walk on rides without paying $149 per person”? I’m almost considering changing our trip dates because of that early close at MK, but should I keep them? I so enjoy your commentary, and I did panic w/o wishes slotted for week 2 , until I reread. So helpful. Thank you!!!!!! Gotcha – thanks so much! Nov. 29-Dec. 3 is another option for us…thoughts on that time? Your crowd calendar has me leaning towards it anyway, then when I saw the 4:30 close on 11/17, I’m even more torn. Appreciate your help!! Thanks for the information. We just came across the November 17 early close so a quick Google search got me here. When you talk about the paid event Disney is offering, what do you mean? If there is another way we can pay to get into MK that evening, I would pay $149 :-), Thanks again! Early Morning Magic allows guests who pay an additional cost to enter the Magic Kingdom or Hollywood Studios currently. You enter 7:45am and are provided breakfast as well. Search Early Morning Magic here on the blog and you’ll see a review. It was ready by then last year. Just curious on the Monday MK rule – would it still be ridiculously crowded if we plan to hop there on a Monday evening (no EMH) for BOG dinner, 3 FPP, and rides during parade and fireworks? Or do you think we’ll still be miserable?